Without taking much of your time, the IT couple of Bollywood has finally revealed their wedding date. We are taking about Padmaavat stars Ranveer Singh and Deepika Padukone’s wedding. 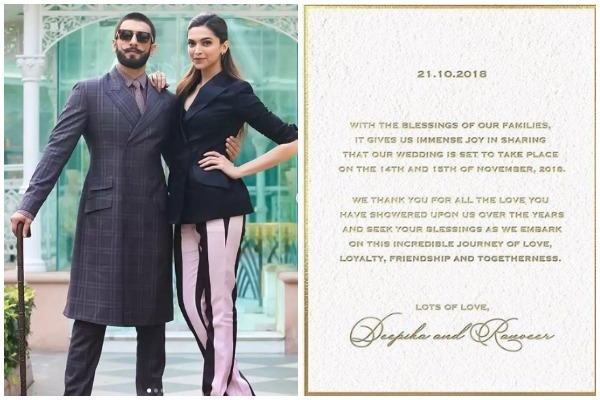 Ranveer Singh and Deepika Padukone have just shared the wedding invitation card through Instagram. Ranveer and Deepika’s wedding card looks elegant, simple and most importantly it’s in Hindi and English language to share the most exciting news with their millions of fan followers. Ranveer Singh and Deepika Padukone have officially released their wedding dates through Instagram and Twitter handle. The couple are all set to tie the knot on 14th and 15th of November 2018. Putting all the speculations to rest, DeepVeer are truly living up to the rumours and are getting finally getting married. Rumours have it that Ranveer and Deepika are going to have destination wedding in Italy. It’s clear now that Deepika Padukone is getting married before Priyanka Chopra. Priyanka Chopra is most probably getting married in the first week of December 2018. However, we are waiting for the actress to confirm on the same. For now, we have a reason to smile and party as our favorite couple Deepika And Ranveer are set to say “I Do”. Previous : Badhaai Ho Movie Review[3/5]: Ayushmann Khurranaa and Neena Gupta’s Family Deserves All The Badhaais!